ANNAPOLIS, MD (January 1, 2016) – We've never seen an invasive species quite like this one before. 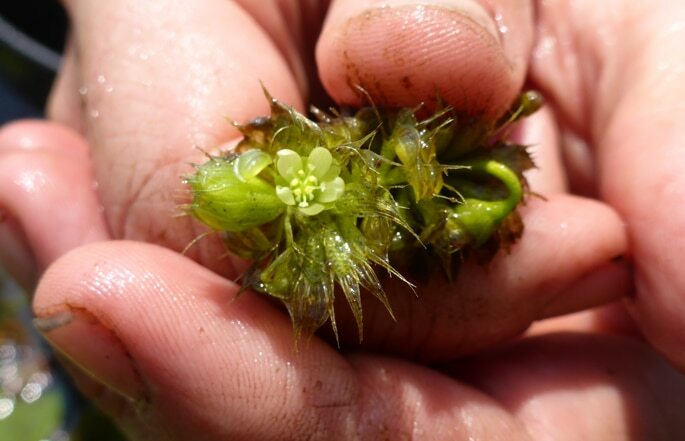 The waterwheel (Aldrovanda vesiculosa L.) is an herbaceous carnivorous aquatic plant closely related to sundews (Drosera spp.) and Venus flytraps (Dionaea muscipula). It catches animal prey through an active trap mechanism, much like the Venus flytrap, by snapping its mouth-like leaves shut when they are triggered. 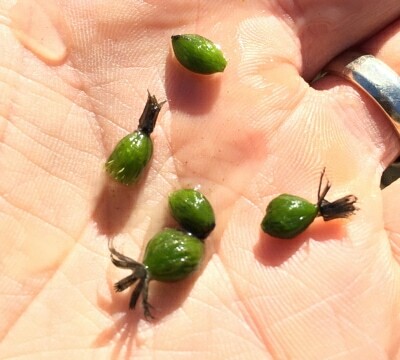 Found at the tips of the leaves, traps may number as many as 200 per plant. Estimates by researchers are that 80% of the traps may contain prey at any given time. These traps catch untold numbers of insects and other animals, which gives this invasive species a new twist — not only can it invade wetlands, but it also impacts habitats by predation. This predation gives scientists great concern about waterwheel's effect on food webs and its impacts on rare invertebrate species. Waterwheel is unique among our invaders because it is an IUCN Red List and Globally endangered species. Aldrovanda is globally rare and declining where it is native in Eurasia and Africa. In North America it is known to be introduced and locally abundant only in New Jersey, New York, and Virginia. The introduced populations in North America rival or surpass in size the largest populations in the species' entire natural range. A single pond in New York is estimated to have a population of several million individuals. Thankfully, waterwheel has yet to be documented in Maryland. Waterwheel flowers may only open for a few hours before sinking back beneath the water level for seed production. MISC has selected waterwheel as the January Invader of the Month to raise awareness of this species during next growing season. Waterwheel is a rootless, floating aquatic plant. It has jointed leafy stems, with whorls of six to nine leaves less than half an inch long. Each leaf has a kidney-shaped hinged blade with bristles on each side, which snaps shut around any insect unlucky enough to land on the blade. The tiny greenish-white flowers are solitary, in the axils, with five petals and stamens. Fruits are also five-parted; they are small round capsules, with glossy black seeds. 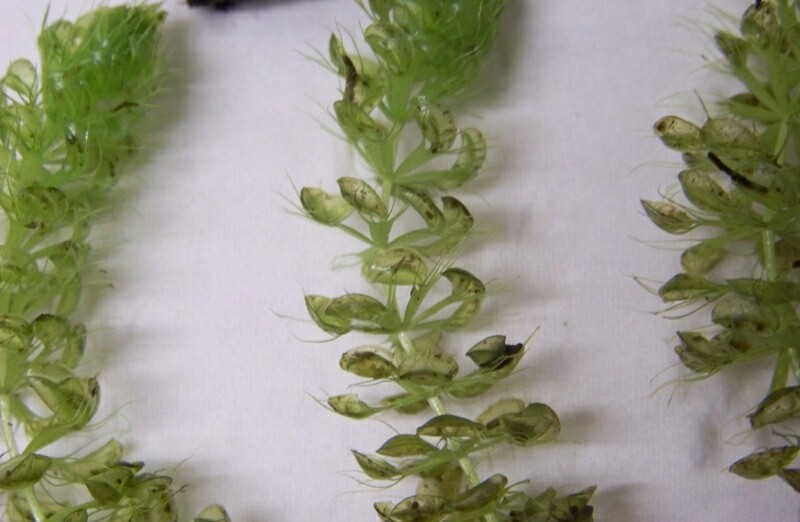 Superficially, waterwheel is very similar to Hydrilla (Hydrilla verticillata), a rooted, rhizomatous aquatic, in overall appearance and abundance. 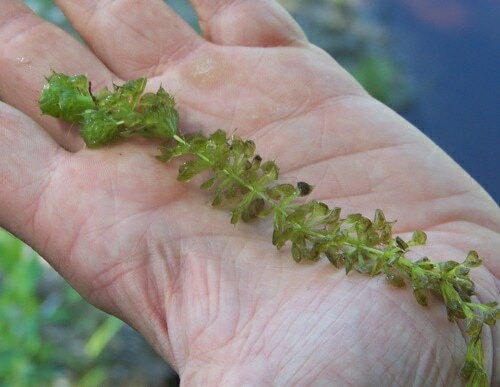 Care must be taken to distinguish the two (see Hydrilla pictures from the Invader of the Month – June 2009). Waterwheel is currently known to occupy manmade wetland habitats, blackwater seeps, and pools of acidic and tannic water. In optimal conditions it can grow at nearly exponential rates, doubling its mass in 13-15 days, growing 9 mm of new stem and one new whorl of carnivorous leaves per day. A single individual can produce 20-30 new shoots of leaves per year. Waterwheel can spread by seeds, the transportation of leaf material, and turions. Waterwheel plant turions up close. Turions are densely packed tiny football-shaped clusters of modified leaves at the end of each plant. As the growing season ends and the waterwheel senesces, the turions remain. 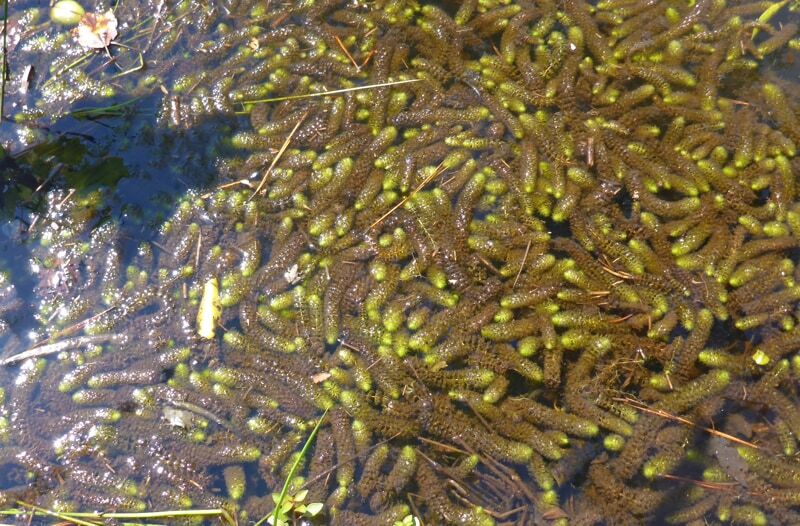 These will sink to the wetland bottom by late November and float back up to the pond surface by early April. Turions are also tolerant of desiccation. Waterwheel can be moved by from birds, beavers, and even boats, on which it has been documented as a hitchhiker. So how did the waterwheel get here? It is a long and sordid story, involving the intentional planting of the species in the late 1990s at various locations in NJ and NY, by well-intentioned individuals who hoped to provide refugial patches for the species in North America in case it went extinct in its native range. For those interested, Lamont et al. (2013) do an excellent job of documenting the introductions in North America. Though well-intentioned, these deliberate introductions may come back to haunt us, as this species spreads across eastern North America predating on native fauna and impacting habitats in ways we've never before seen. No documentation is available on the species that waterwheel consumes in North American wetlands. Controlling waterwheel is a serious task, though there is little data on the topic. No control efforts have yet been successful in Virginia, where the most control work has been done. In 2014, 36 pounds of turions were collected and removed from a pond at Fort A.P. Hill, VA with no apparent impact to the waterwheel population in the subsequent year. Waterwheel can easily overwhelm a water body once established, causing many problems for humans and ecosystems. The waterwheel plant survives the winter as turions, which will sink to the bottom of the water column to avoid freezing. Photographs courtesy of Fort A.P. Hill, US ARMY 2015. Photos available electronically on request. 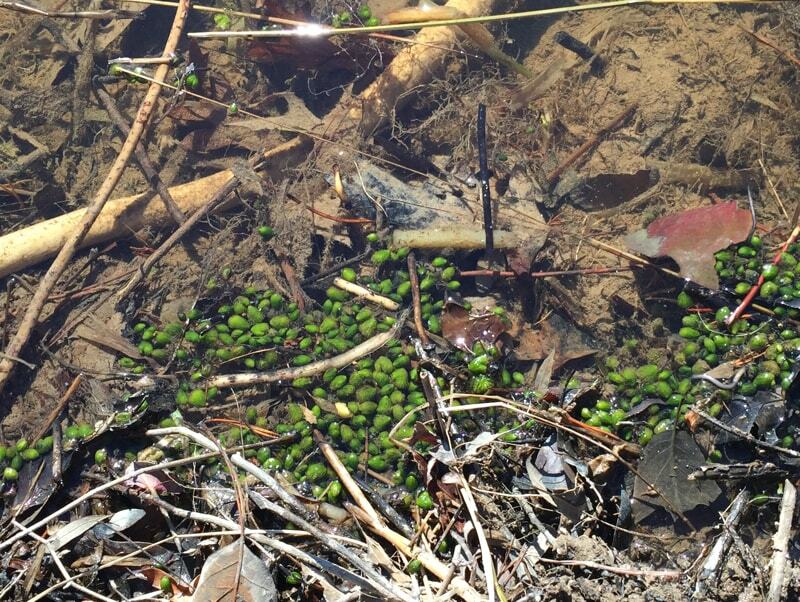 Virginia Flora: Aldrovanda vesiculosa L.
Invader of the Month aquatic plants. permalink.